This work has the appearance of a travel souvenir book, but it functions as a vehicle for an urban studies exploration of man-made hills in the city of Bologna. “Artificial” hills are the only hills in the center of Bologna, as the area from there to Venice is largely a flat plain which was once an inland sea. From the perspective of a native of New England, these strange little hills are perplexing, as they are not the result of glacial activity. The hills have been photographed at the end of the 20th century, but the images appear to be much older, to create a feeling reminiscent of 19th century photographs. The chemicals and the printing processes used, requiring two printings and four baths for each of twelve photographs, are historical themselves, as well as being extremely archival. Under each photograph, a text on the left printed in letterpress describes what each hill was and what it has become, while a rhyming poem on the right gives an amusing description of the nature and evolution of these various categories of hills, largely unnoticed by Bologna’s inhabitants. Francesco of Bologna, more commonly known as Francesco Griffo, was the man responsible for cutting the first italic or sloped text in 1501. Inclined texts became known as Italics for he created it in Italy while working for Aldus Manutius in Venice, who sought an economical and legible way to manipulate space in the printing of book texts. Artificial Hills represents the manipulation of space in urban contexts, specifically Bologna. Just as cultures have incorporated and recycled the architecture of previous inhabitants, giving birth to one category of artificial hills, printers and type designers have always built on the work of others. This book was printed in Garamond, sometimes recorded as Garamont (mountain) which derives from and is built upon the “De Aetna” type, cut for Manutius by Griffo. Similar types were produced at the same time by Simon De Colines (Simon of the Hills) in Paris around 1525, also later taken up and built upon by others. Printed in moveable type by Stamperia Valdonega on Fabriano museum board and bound with strips of bookbinding cloth in a panorama format. Corners rounded individually with a 19th century manual cutting machine. Presented in a red cardstock box with real gold lettering also printed by Stamperia Valdonega and die-cut to show the first hill presented of the book inside. The photographs, which were painted upon, modified, and re-photographed, are a collaborative effort between the author and Guido Piacentini, who hand-printed each one. in collaboration with photographer Guido Piacentini. 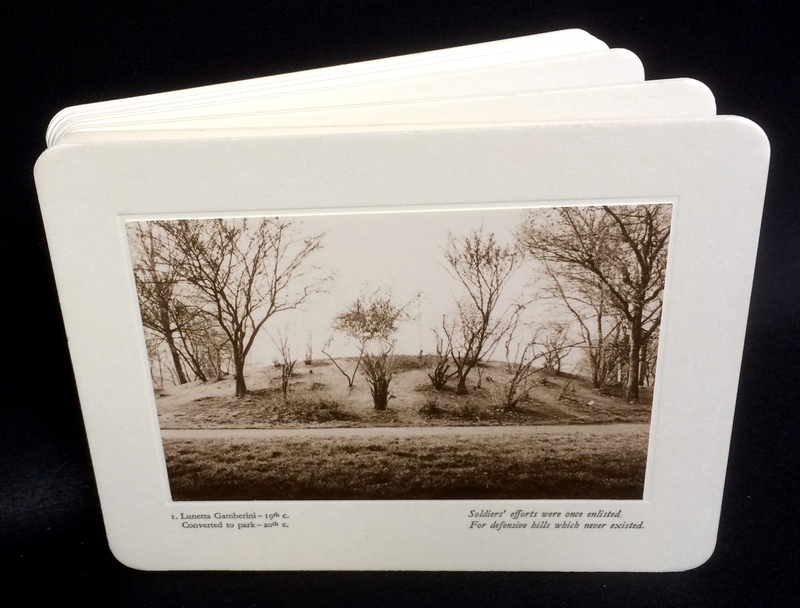 The images for Artificial Hills were photographed using a Nikon F3 camera with various lenses on Ilford Delta 400 film, developed in Ilfosol, and printed on AGFA Classic 118 FB photographic paper. Each of the 12 images was originally printed in black and white in different versions, manipulated by Guido Piacentini in the printing process to evoke the peculiarities of 19th century photographs. The artist, Angela Lorenz. 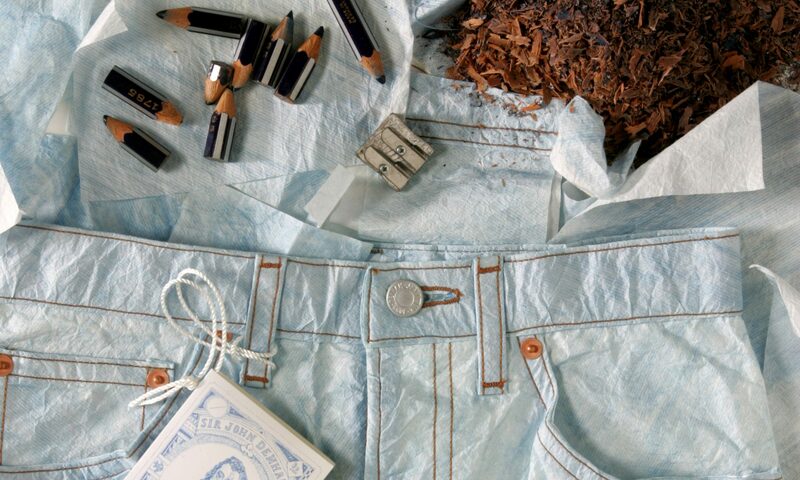 further manipulated them through painting, tearing, folding, and collage. These definitive images were then re-photographed, and it is this subsequent printing that involves unusual processes. The process used to create the final prints is among the oldest still in use after its invention in the 19th century. The sepia toning creates prints which last longer, in archival terms, than those in black and white. For Artificial Hills, which mimics a 19th century panorama tourist album, this process was chosen not only for archival reasons, but because it is appropriate conceptually. The final printing process consisted of exposing the definitive image on the photographic paper and developing it in Neutol. It was then fixed, rinsed for an hour, and dried. (At this point, it was still a black and white print.) Once dried and inspected, each print was put into a bath of potassium ferricyanide (making the image disappear) and rinsed quickly. After this, the images were treated in a bath of sodium sulfite, allowing for the images to re-appear, now sepia-toned. Finally, the prints were rinsed for an hour and air-dried. A vinyl archival glue was used to adhere them to the conservation board. 1. Lunetta Gamberini -19th c.
Converted to park – 20th c.
Soldiers’ efforts were once enlisted for defensive hills which never existed. 2. City Wall – 14th c.
With reinforced dirt – 16th – 18th c.
Transported dirt, packed and mounded, absorbed the shock when cannons sounded. 3. City Wall – 14th c.
Converted to monument for Giosué Carducci – 20th c.
But when hill utility did decease, they put in statues and planted trees. 4. Earth and treetrunk foundation for wooden tower (?) – 4th – 6th c. beneath San Giovanni in Monte – 13th c.
In Barbaric times renowned for dearth,hills were created with trunks and earth. Wooden towers atop no longer remain, yet later constructions grace the terrain. 5. Roman Temple – 1st – 2nd c. A.D.
and Imperial Palace – 11th – 12th c. beneath Via Porta di Castello. Even when rock was used to erect, structures fell to abuse and neglect. 6. La Rocca di Galliera – 14th c.
Civic dump – 15th – 17th c.
Converted to Montagnola Park – 17th c.
Gradually covered with earth and ash, some actively became a place for trash. 7. Bentivoglio family designated trash deposit 15th – 16th c.
Later filled with demolished family buildings at their fall from power – 16th c.
Converted to Via del Guasto Park – 20th c.
Eventually some of these civic dumps, were rounded into recreational humps. 8. Refrigerator (ice-house) for the no-longer existent Villa Caprara – 17th c. rear view. 9. Refrigerator (ice-house) for the no-longer existent Villa Caprara – 17th c.
What might seem a tomb was a refrigerated room, front view. 10. Refrigerator (ice-house) for Villa Insom – 17th – 18th c.
11. Sculpted landscape for Villa Cavazzona – 17th c.
The most superfluous mounds kinetic were bereft of function, barring aesthetic. 12. Lunetta Gamberini – 19th c.
upon their resurgence do they pause to reflect?